The Mayor’s husband merrily displays our tasting glasses at Colorado Brewers’ Festival. 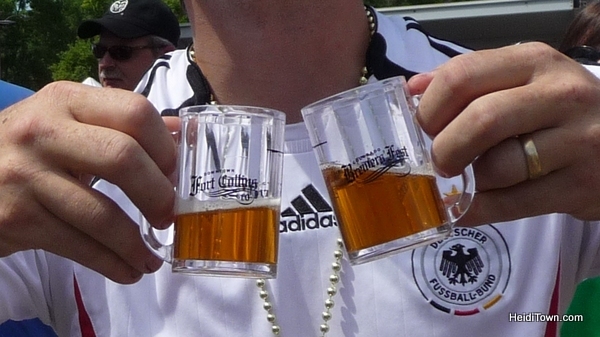 So you’ve decided to spend a weekend in Fort Collins – a very good choice, and even better if you plan your stay around Colorado Brewers’ Festival, June 22-23, 2013. In its 24th year, this is one of the first Colorado brew fests and my favorite. With multiple music stages, lots of shade and of course, lots and lots of beer, the Colorado Brewers’ Festival ticks all the right boxes on my What Makes a Great Festival list. Instead of giving you a specific schedule, I’m going to throw out a bunch of my Fort Collins favorites and let you organize your own fabulous weekend. So without further ado, here’s my 3-day Fort Collins itinerary during Colorado’s Brewers’ Festival. 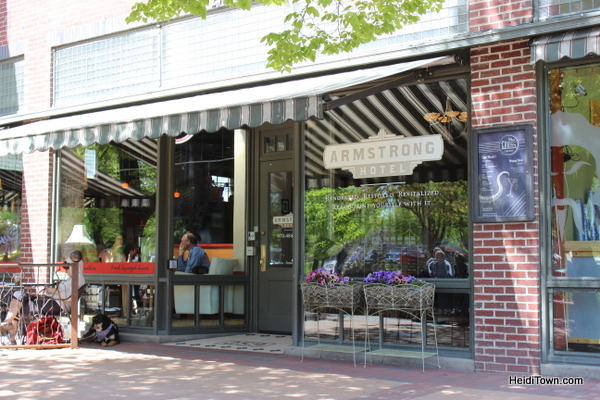 As a fan of boutique, downtown hotels, The Armstrong Hotel is my recommendation for a weekend stay in Fort Collins. This historic property is within walking distance of restaurants, museums, galleries, theaters and, of course, the Colorado Brewers’ Festival. The Armstrong Hotel in Fort Collins, Colorado. I took my husband to The Armstrong for his birthday a number of years ago, and we were delighted to find charming rooms that really are one-of-a-kind. Our room was huge and had a bright and cheery, contemporary sort of feel. The best part about staying at The Armstrong? With the exception of the Discovery Museum and Fort Collins Brewery, every place mentioned in this post is within walking distance of the hotel. And you could make it to those two places by foot too, but you might want to pull on your hiking boots. Fort Collins has a lot of good eateries, and it really comes down to personal taste when deciding which one to patronage. 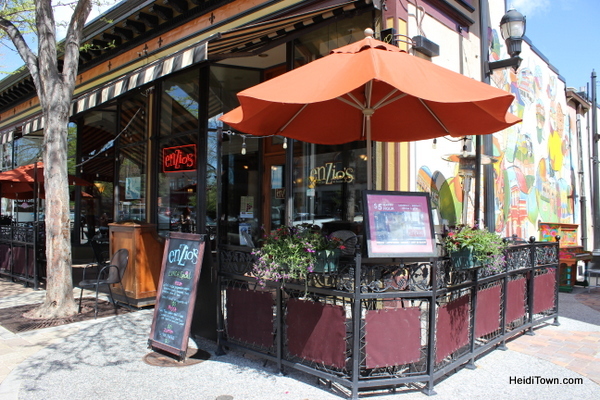 For classic Italian Bisetti’s has been a local favorite for more than three decades. For Italian with a nouveau twist, try Enzio’s – their fresh basil mojito is worth a visit. Enzio’s Italian Kitchen in Fort Collins, Colorado. If you are looking for a restaurant with contemporary cuisine with items such as chicken and waffles, smoked bacon mac-n-cheese or poutine, Gravity 1020, inside the Fort Collins Brewery is your best bet. Plus, they have a waitress that looks exactly like Penny from The Big Bang Theory. Nerd boys, you are welcome. For breakfast, we’re longtime fans of The Rainbow. My husband compares every other restaurant’s waffles to the waffles at The Rainbow, and so far, none have measured up. You also can’t go wrong with the Silver Grill, a local favorite serving huge meals that never disappoint. Lunch is an option here too and they make a mean hamburger. 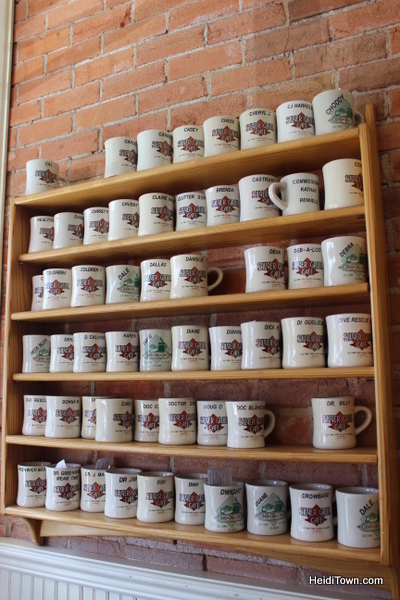 Customer mugs inside Silver Grill in Fort Collins, Colorado. There’s a restaurant to suit nearly every taste in Fort Collins, from seafood to steak to Asian, so ask a local what they recommend and have fun exploring on your own. I’d recommend dedicating an entire day of your trip to the Colorado Brewers’ Festival. Bring a blanket and camp out at the various music stages around the event. Take the occasional swing through the brewery tasting areas and then camp out again. I’ve followed this routine for the last several years at Colorado Brewers’ Festival and it is the perfect way to experience this event. While general admission tickets get you in the fest from 12 to 6 p.m. on Saturday and Sunday, VIP tickets get you in an hour early on both days. Go HERE to purchase your tickets now. 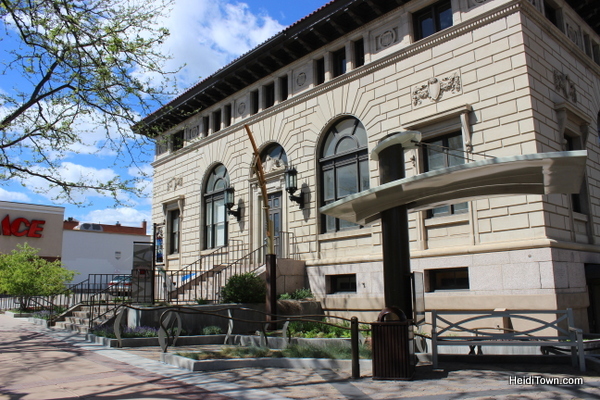 The Fort Collins Museum of Art is just a block away from The Armstrong Hotel. You could also tour the Museum of Discovery. Take it from me, even if you don’t have children, this place is pretty cool. 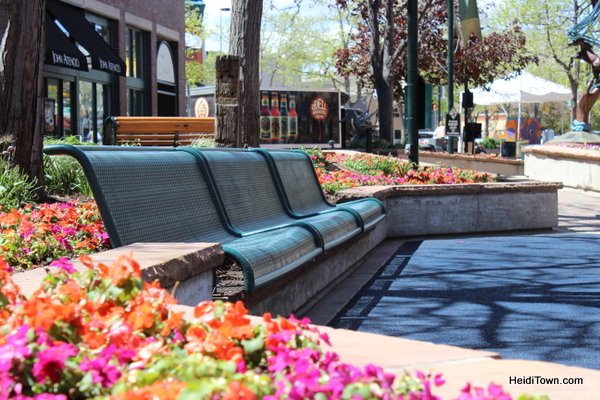 Strolling through downtown Fort Collins is a great way to spend an afternoon. Pop into the occasional store or gallery or just sit and relax in Old Town Square with a pastry and cup of coffee from Little Bird Bakeshop – I think they have the best coffee in town. Bench in Old Town Fort Collins, Colorado. 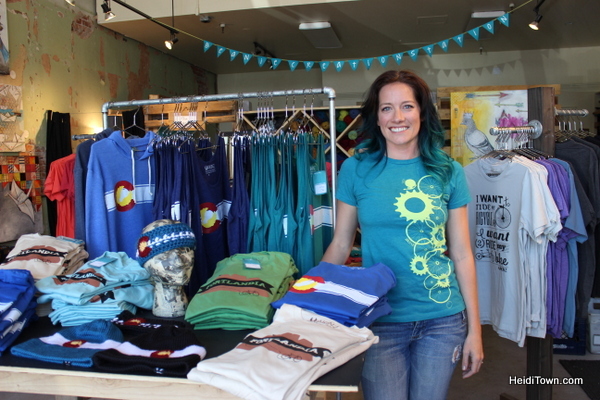 Suzanne Akin poses in her store, Akinz, at 15 Old Town Square #132 in Fort Collins, Colorado. Don’t miss my favorite retail shops downtown, including the Perennial Gardener (I love their collection of bird houses), and Akinz. When you see the amount of Colorado branded clothing they have, you’ll know why Akinz is a favorite. Plus, Suzanne is a true artist and has designed nearly everything in the shop, and she’s handmade some of it as well. 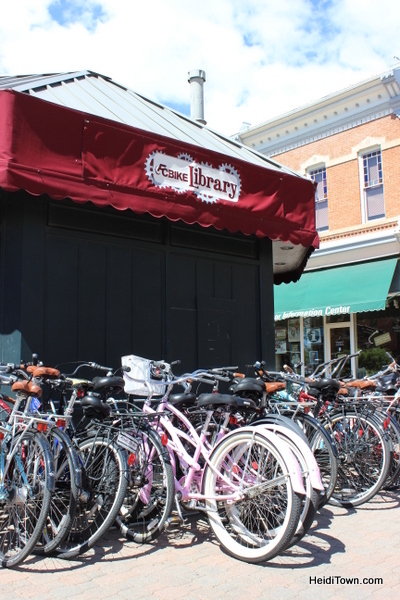 If you’d like to borrow a bike while you’re in town, be sure to check out the Fort Collins Bike Library, right next to the Visitors Information Center in Old Town Square. Become a member online here (it’s free) and reserve your bicycle in advance or show up and grab a bike while you are in town. The Fort Collins Bike Library in Old Town. So there you have it, a simple 3-day itinerary for Fort Collins, Colorado. Even you don’t make it to Colorado Brewers’ Festival, and I sincerely hope that you do, a weekend in Fort Collins should definitely be on your itinerary this summer. Questions, concerns, suggestions? Leave a comment below. Two other bloggers have written a 3-day itinerary for Fort Collins during Colorado Brewers’ Festival. Read Fermentedly Challened post here and The Brew Bros post here. Thanks for stopping by. I’d be interested to know when you last attended CO Brewers’ Festival? It is now held in Civic Center Park and there’s TONS of room. Even when it’s crowded. Don’t get me wrong, the event gets crowded, but if you time your visit right you can avoid the crowds. Or take a break from drinking and sit under a tree for awhile listening to a band! I just heard that the connoisseurs event associated with this event is not being held by Choice City Butcher. Instead the Fort Collins Downtown Business Association jacled it and is not involving Choice City Butcher. Mayor, do you know anything about it? If it is true, bad form on the DBA. Choice City Butcher is requesting a boycott of the Connoisseurs Event. The DBA has always held a brewers’ dinner on the eve of the festival. To address this situation in a professional manner, they have changed the name of their Friday evening event to All Brewers’ Eve.